Fall is here! Can’t you just smell the pumpkin spice everything? There’s something that is so exciting about the change of seasons–especially when it comes to fall. The change in weather, cozy blankets, pumpkins everywhere, and so much more. One fall staple that doesn’t get as much love as it deserves is the scarecrow. But not anymore! 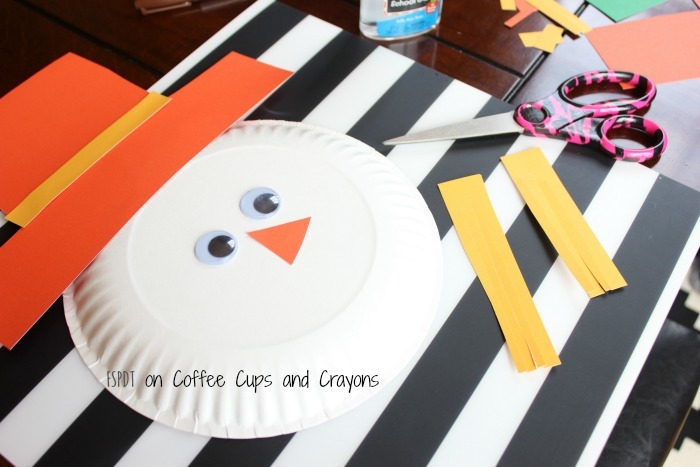 This adorable scarecrow paper plate craft is both fun to make and to play with. Add it to your fall bucket list today! Paper plate crafts are cheap and easy to make. 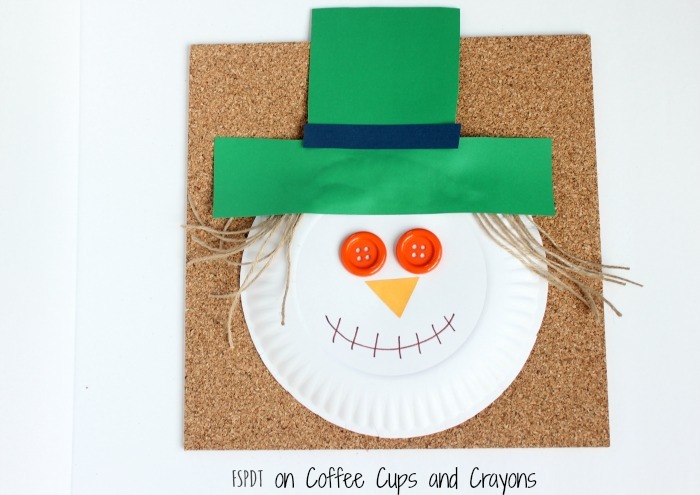 You probably already have all the supplies you need to create paper plate scarecrows in your craft cupboard. They are also great for multi-aged or large groups of kids to make at once which make them perfect for play dates and classroom parties. Just set out the supplies and let kids create. 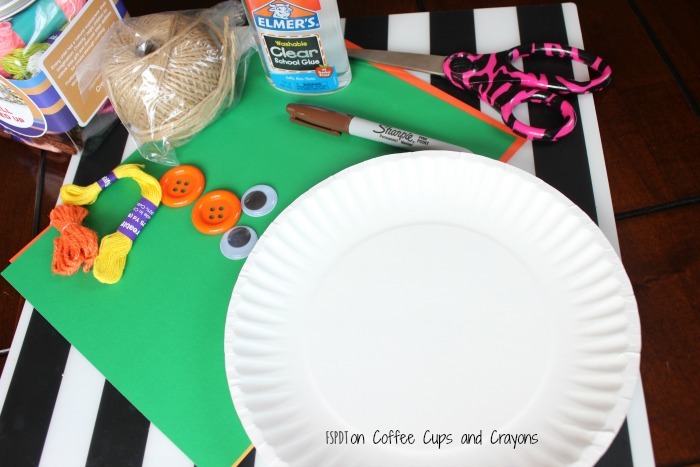 You’ll soon have a sea a unique and adorable paper plate scarecrows to decorate or play with! To start gather all your supplies. There are a lot of ways to decorate or create your scarecrow paper plate so substitute craft supplies for any you already have on hand. Trace a hat on color paper and cut out for younger kids. Older kids can cut out their own hats if they’d prefer. Cut out a band for the hat. We used yellow for our orange hat as seen below. Cut out orange noses from the paper too. It’s fun to provide a variety of shapes to choose from. Set out “hair” supplies. Kids can choose yarn, paper strips, etc. It’s fun for them to give the scarecrow a “haircut”. Let the kids create! Encourage them to design their scarecrow any way they want. It’s fun to see all the different types of scarecrows they come up with. 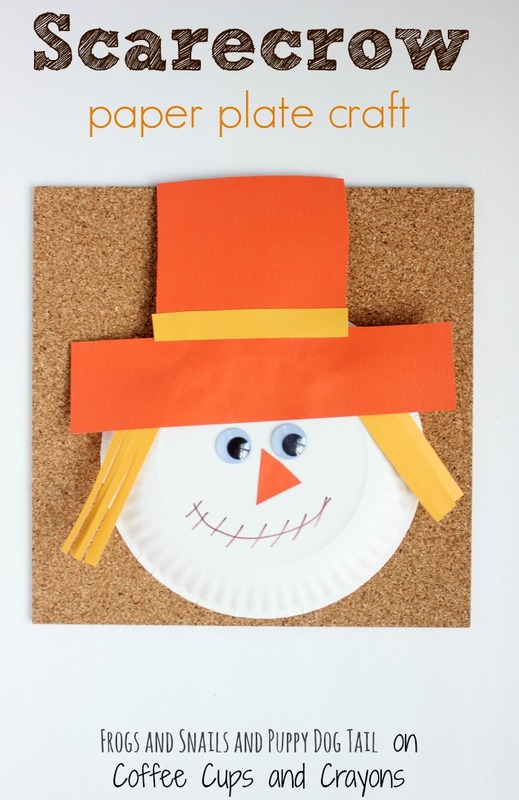 Once the kids can finished their scarecrow paper plate craft it’s time to play or decorate with it! Hang it on a window or clothesline or add a craft stick to the bottom to turn it into a scarecrow puppet. Kids can pretend to be scarecrows and scare the birds away from the harvest. Scarecrows really do make such fun fall crafts for kids!